A boy called George had a magical plan,One Christmas Eve, frosty and bright. As Santa brought presents to him every year,He'd take gifts to Santa that night. Join George, a young and courageous explorer with all the pluck of a little Indiana Jones, on a very festive quest - to find Father Christmas himself!This time George is heading to the North Pole to deliver lots of presents to Santa for a change! But oh no - Santa and the elves are in trouble, and Rudolf has lost the light from his red nose! 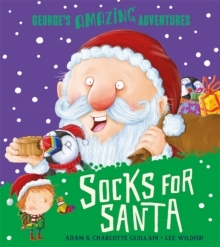 Can George step up and save Christmas?Socks for Santa is funny and heartwarming rhyming romp, perfect for reading aloud to boys and girls aged 3+ who love adventure stories and Christmas. Ideal for fans of Father Christmas Needs a Wee and Aliens Love Panta Claus. George's first adventure Spaghetti with the Yeti was shortlisted for the Roald Dahl Funny Prize and the Sheffield Children's Book Award. Find more treats and daring feats, collect all of George's Amazing Adventures: Spaghetti with the Yeti,Marshmallows for Martians, Doughnuts for a Dragon,Pizza for Pirates,Socks for Santa,Treats for T. rexAdam Guillain is a performance storyteller and was the Roald Dahl Museum and Story Centre Writer in Residence. Charlotte Guillain is a prolific author of children's fiction, non-fiction and picture books, and together they have created the hugely successful George's Amazing Adventures series. Lee Wildish lives in Lancashire and has been illustrating from a very young age. He loves illustrating children's books and thinks there's nothing better than seeing people laughing at a book he's illustrated. His titles include The Spooky Spooky House which was the winner of the Red House Children's Book Award 2013, and the New York Times Bestselling How to Babysit a Grandpa.